Nowadays respiratory problems like asthma are very common due to change in lifestyle. Asthma is one of the most common disease which affects number of individuals. Asthma cannot be cured completely but its symptoms can be manage with the help of herbal treatment. There are number of herbs present in nature that help to ease the symptoms of asthma. It is a respiratory problem in which airways become narrow and swell. 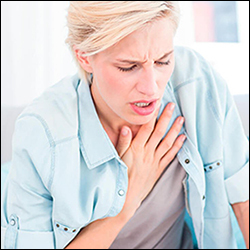 It is characterized by breathing difficulty, coughing, wheezing and shortness of breath. Non-allergic asthma- caused by stress, exercise, illnesses like a cold or the flu, or exposure to extreme weather, irritants in the air or some medications. According to Ayurvedic point of view asthma is known as Swas Rog. Its main cause is vitiation of kapha dosha and pranvayu in body, combines with kapha doshas in the lungs that originates breathing problem due to obstruction of Pranavaha srotasa (Respiratory passage). This condition is known as Swas Rog. 1. Maha Shwasaa – heavy breathing. 2. Urdhava Shwasaa – prolonged upward breathing. 3. China Shwasaa – interrupted breath. 4. Tamak Shwasaa – darkness behind eyes. Santamak – fever and feeling darkness. Aggravated at night time. Pratamak – due to physiological factors. 5. Kshudra shwasaa – subsides by itself. 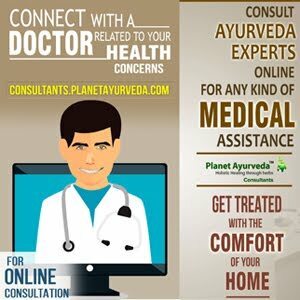 Ayurveda is one ancient system of medicine which follows pure natural treatment. The word Ayur means life and Veda means Science. Ayurveda treats the disease from the root level. The main aim of treatment is to cure the main cause and manage the symptoms. As per Ayurveda bad digestion is the main cause of asthma. Indigestion results in the accumulation of ama or toxins (mucus) in the lungs and respiratory tract which results in the breathing problems. Ayurvedic treatment focus on these causes and restore the digestion with the help of natural treatment. These medicines help to pacify the kapha dosha which is main cause of asthma. Shirish (Albezzia lebbock): It is described as vish-ghan in Ayurveda and removes poison from the body. It helps to remove toxins from the body and enhance the immunity of body. Ashwagandha (Withania somnifera): It is very effective to reduce inflammation and allergies. It provide strength to the overall body and improves immune system of body. Shirish (Albezzia lebbock): It helps to remove accumulated poisons metabolites from body. According to Ayurveda, these ama or toxins in the body get disturbed the normal metabolism that results in problem. Anantmool (Tylophora asthmatica): It is used for the management of allergies, cold, asthma. Its dried leaves are expectorant, emetic and diaphoretic. Mulethi (Glycerrhiza glabra): It is also known as Licorice. It has anti-inflammatory effect on the lungs, which help to reduce inflammation of the bronchial tubes and restore the normal breathing. It also has immune-stimulant properties. BENEFITS:- These herbs are known to very effective to manage the respiratory and lung infections. It helps to relieve the respiratory symptoms and it is best natural remedy for asthma, bronchitis and other respiratory infections. DOSE:- 1 teaspoonful twice daily or take 1 tsp. of the powder and boil in 400ml water until it remains 50-60ml. approximately. Then strain it and drink at room temperature. Try to make it fresh every day. Take it twice daily after breakfast and dinner. These capsules are obtained from standardized extract of Tulsi (Ocimum tenuiflorum). Tulsi (Ocimum tenuiflorum) - It is also known as Holy Basil. It has not only medicinal value but also has religious value. It is very important herb used in the treatment of various respiratory illness and helps to balance overall respiratory system. 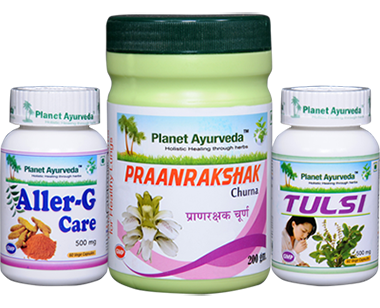 It is also effective against various infections like cold, flu which may be causative factor of asthma and enhance the immune system of body.